Whatever My Lot...: Adoption Day! As our sweet little Luke snoozes away in his swing, I'm so excited to share with you about our Adoption Day. Before I go into the details that I can share, please understand that there is a lot I cannot share here. 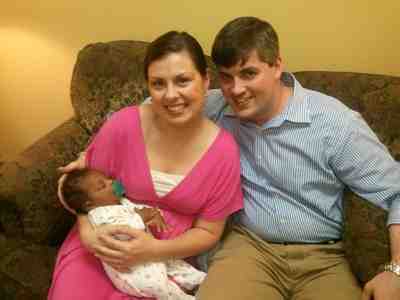 Our little boy was loved from the moment of his birth and his birthmom chose adoption for him in love. We are incredibly thankful to her and to God for this amazing gift! Monday evening I was able to talk to the foster mom who had been caring for Luke. She told me all about his little personality, his schedule, and how he likes to sleep. 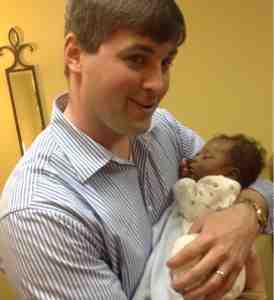 Luke was 6 weeks old exactly on Monday, and he had even visited the pediatrician. Healthy little man! It was so helpful to talk with the foster mom and I will cherish her part in Luke's life forever. Tuesday morning, Hampton and I drove to our adoption agency office to complete the final paperwork that would make us legal parents of Luke. We had a great conversation with our case worker and signed all the papers in just a matter of minutes. We were excited and nervous and anxious, yet God reminded us of his perfect peace that surpasses all understanding. He also gave us a special blessing right there in the agency office that morning. A group of ladies from a local church were volunteering there and asked to pray for us before we drove the rest of the way to get Luke. It was such a special time of prayer and fellowship with ladies we had never met before, but we KNEW because of our common bond in Christ. After many well-wishes and loving thoughts, our case worker sent us to the other office another 2 hours away to meet our little boy. We arrived at the office before the foster family, so we sat and talked with the pregnancy counselor there who had worked with the birthmom. She gave us medical records and all kinds of information that brought us a little closer to knowing our little boy. Finally, they were here! The foster mom walked in with Luke and with tears all around, she placed him in my arms. I was overcome. We have a son! There were many pictures and more tears (not as many as I thought there would be), and we were left alone with our little boy. The next few minutes were spent oohing and gooing at Luke, as he opened his eyes and saw his new parents for the first time. 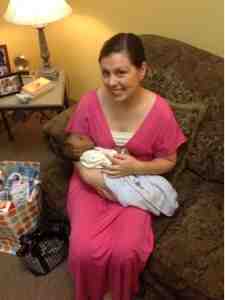 The foster mom and her son prayed for us and said goodbye. We gathered our things and then, just like that, it was time to go. Time to take Luke home! 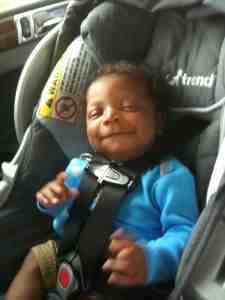 As we loaded him the the carseat and into the backseat, I was still in shock. We are going home with our son!!! We had decided that I would ride in back in case Luke needed anything. The 3-hour trip home was mostly uneventful. Luke slept for most of it, we stooped once to change him, he gulped down a bottle, and then got antsy the last 30 minutes from home. We finally pulled into the driveway and unloaded all of our stuff. I carried Luke inside in his carseat and he was finally home! We are incredibly blessed to be a three person family! I'm looking forward to sharing some of what we have learned about our Luke in the next post!